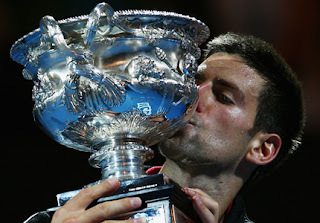 As we are in the offseason and there is no tennis to speak of, I thought I'd give my own end of year awards, plus my thoughts on who to watch going into a sure-to-be very exciting 2013. No player has ever had to work harder to win a Grand Slam. Djokovic started the year #1 and ended the year #1 (albeit in the last two weeks of the season). He made three Grand Slam finals and won one, the Australian Open. He won six titles (AO, Miami, Toronto, Beijing, Shanghai, and the World Tour Finals) and made five other finals (Monte Carlo, Rome, Roland Garros, Cincinnati, US Open). He followed his amazing 2011 season with a solid 2012 campaign, and to me, he was the best player overall throughout the course of the year. After the Australian Open, he struggled a bit, understandably, but after winning Miami, he had a great clay court season and nearly won the French Open, which would have been his fourth Slam in a row. After losing four times in a little over a month, he rebounded strongly to have the best second half of the year (post-Wimbledon) with four titles, culminating with his 2nd year-ending championship where he went undefeated. He finished the year winning 15 of the 16 matches he played in. He did lose the #1 ranking to Federer but he had so much to defend in the first half of 2012 it's understandable (plus Federer raised his game and made a strong push in the first half of the year). While Djokovic gets my vote as the player of the year, the all-time leader in Grand Slam titles was the most impressive player of the 2012 season in my opinion. He won 6 titles (most since 2007) and returned to world #1. He won a Grand Slam at 30 years of age, which hadn't been done in nine years since Agassi lifted the Australian Open trophy in 2003. He won over 70 matches (71) in a year for the first time since 2006 and between Rotterdam and Cincinnati he went on a run of 49-5, including stretches where he went 16-0 and won 18/19 and 21/22 matches (Wimbledon-Cincinnati and Rotterdam-Madrid). He also became the first player to win a Masters title without being broken, when he did so in Cincinnati (though that tournament will be remembered as the time he bageled Novak Djokovic, I believe). Last but not least, he won a medal at the Olympics, silver, which was the only thing he had been missing from his resume. He will go down as the only champion to have won on blue clay, and the way he handled that entire week was inspiring. Unlike Djokovic and Nadal who complained about the surface, Roger adapted and played some of his best tennis of the year. At the start of the week against Milos Raonic, he struggled from the baseline so he switched to serve and volley tactics. But by the final against Tomas Berdych, he was chasing down heavy groundstrokes like the King of Clay himself, Rafa Nadal. Federer won his 7th Wimbledon. He regained the #1 ranking. He broke the all-time weeks record at #1 and ended up stretching his record to 302 weeks. However, what may have been most impressive about his season was what happened previous to it. After having years in 2010 and 2011 that some (and maybe he) would find disappointing, he started the year with a goal in mind and did everything he could to achieve it (the goal being to reach #1). He won a lot of close matches and showed the kind of heart and drive that would bring him success at Wimbledon. Simply, what Federer did in 2012, at age 30-going-on-31 was just outstanding. To have the motivation and commitment of a player ten years his junior, after everything he has accomplished, is quite unbelievable. For much of the first half of 2012, he was the player to beat, and he was perhaps a few matches away from becoming the year-end #1. The 28 year-old Italian gets my vote for most improved player of the year for a few reasons. He reached a career-high ranking of 22 in October and finished the year #23, up from #38, where he started the year. However, it was his play and results that really stood out as a big improvement. It started in Belgrade where he won his 2nd ever title. Then two weeks later, he made the quarterfinals in Rome, before losing to Federer. He also took part in one of the most entertaining and dramatic matches of the year against Stan Wawrinka the round before, where he saved many match points before winning in a third-set tiebreak. Then at Roland Garros, he followed his good form up with a 4th round appearance against Novak Djokovic, where he took a two set lead before the Serb came back to win. After that, he made the finals in Eastbourne before losing to Andy Roddick (he will hold the distinction of being the final player Andy beat to win a title). After the US Open, he led Italy back into the World Group with a win over Chile, and then made the finals of Metz, a 250 event, losing to Tsonga. He finished a vastly improved year with a win in Moscow, where he defeated Thomaz Bellucci in the final. 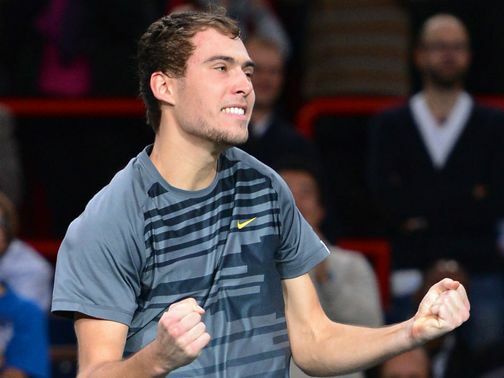 Janowicz started 2012 ranked #221, and ended the year ranked #26. The Polish 22 year-old made a huge splash in the final Masters event of the year in Paris, where he made the final, defeating four top 20 players (including Andy Murray) before losing to David Ferrer. However, his improvement in the rankings was not only due to that finals appearance in Paris, as he was already #69 before that tournament started. He won three Challenger events, in Italy, the Netherlands, and Poland, and he made the 3rd round at Wimbledon before falling to Florian Mayer. His jump of 195 spots in the rankings was remarkable and he is a player worth keeping an eye on as 2013 unfolds. The veteran German started the year outside the top 200. By August, he was in the top 25. How did he do it? It started at the French Open, where he made the 3rd round after going through qualifying. 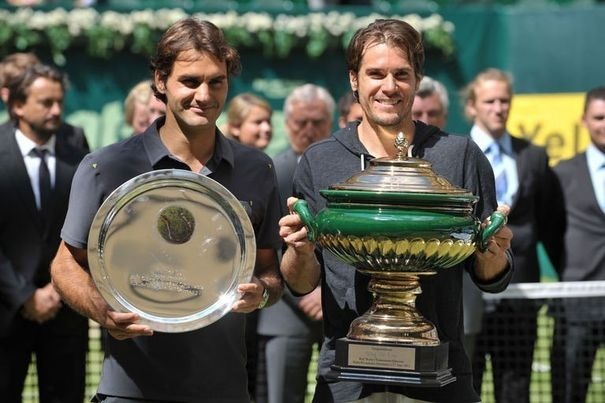 Then he went into his home country and won the Halle title on grass against Roger Federer. After a first round loss at Wimbledon, he made the final in two 500 events, Hamburg and Washington, losing to Monaco and Dolgopolov respectively. He followed that by making the quarterfinals in Toronto and pushing the then world #2 Novak Djokovic to 3 sets. He capped off a great year with another quarterfinal appearance in a Masters 1000 event, this time in Shanghai, where he again lost to Djokovic. Haas finished the year ranked 21 - and he started the year #205, a 184-rank jump in 11 months. With being 34 years old, very old in tennis terms, and coming off many injuries, the former world #2 gets my vote for Comeback Player of the Year. This sums up Isner's Grand Slam season. There were many expectations on the big American heading into the season, and he didn't live up to any of them. He lost in the 3rd round of the Australian Open, 2nd round of the French Open, 1st round at Wimbledon, 3rd round at the US Open. He performed well in the Davis Cup and made his biggest impact at Indian Wells where he upset Djokovic and lost to Federer in the final (he entered the top 10 briefly after this), but overall, it just wasn't the year many thought he would have. He overscheduled and therefore didn't allow himself to play his best when it mattered most. He played 21 tournaments and three Davis Cup ties, and he put too many miles on his body. A guy like David Ferrer can keep up with playing a lot of tournaments, but not a guy like John. His style of play was also poor, as he chose to lumber around the baseline instead of attacking. In essence, he paid the price for exposing the glaring holes in his game. Who to watch for in 2013? Rafael Nadal: It shall be interesting to see how the Mallorcan responds after missing the second half of 2012. Will he be the same player he once was? He has said he will be changing his schedule up to help reduce his injuries, but could he pay for that in the rankings? Grigor Dimitrov: At #48 in the world, will 2013 be his breakthrough season? He has been touted as a talented player with the potential to do great things, but can he be good enough week in and week out to break into the top 30? Top 20 even? Milos Raonic: The big-serving, lanky Canadian had a solid 2012, in which he reached his career-high of 13 to end the year. He had two wins over Andy Murray and three close losses to Roger Federer (he probably should have won the last two). As he starts hitting his peak years, he will be a top 10 contender and will look to make the final eight at majors next year. Juan Martin del Potro: It appears as though the big Argentine is back to the form he displayed throughout the second half of 2009. Delpo had a great year, winning 65 matches, four titles, and a bronze medal. He was stunted by Federer six times (including the French Open and London Olympics) before winning the final two matches in Basel and the World Tour Finals. He will be a very dangerous threat to the top 4 in 2013, and I'm sure he has a major on his mind. And the thing is that he has the game at all four majors, so he should be a consistent threat year-round. Really good choices, Kyle. The only one I'd debate is most improved. Seppi lost steam after Roland Garros. David Ferrer made substantial across-the-board improvements, and Andy Murray took some major steps forward. Isner as the most disappointing player is a superb choice. It would be easy to take someone like Berdych or Tsonga, but not enough attention has been given to the magnitude of Isner's failures. His performance at Indian Wells showed how much game he has.... and how much talent he squandered at each of the majors in 2012. And most improved I'll go for Klizan. Sepmug went off the rails after losing at the French to Djoker.